Begin by cutting out your shape. I traced a star on a cardboard cereal box. Then, I found a juice cap just the right size for the center of the star. Repeat the same process with a circle if desired. Cut out the shapes with a craft knife. Everything will be covered up with pom poms, so it doesn’t matter if it’s not perfect! 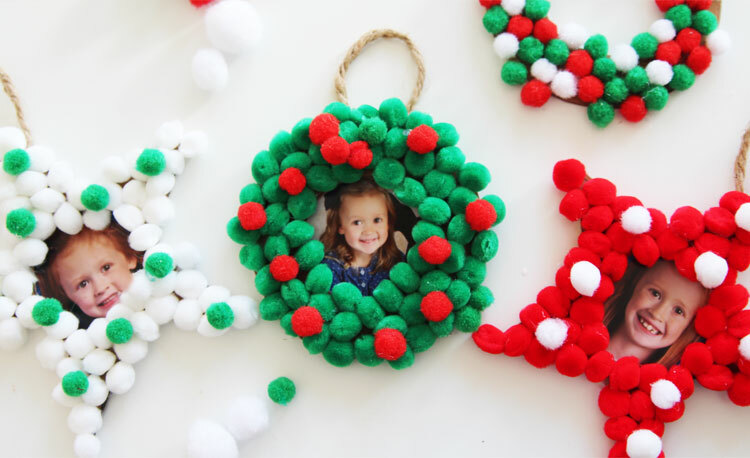 Working in sections, begin applying glue and placing the pom poms on the ornament. After the glue has dried, attach some twine or ribbon to the back with hot glue. Next, cut your photo to fit and attach it on the back with some more hot glue.